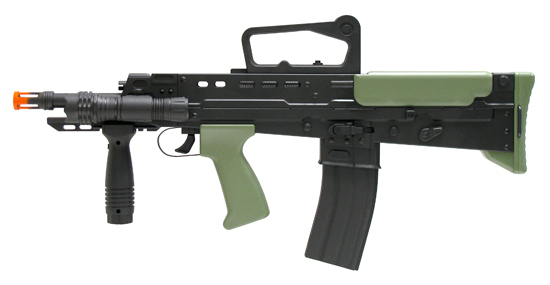 The Spring L86A2 is an assault rifle with bullpup configuration. The action and magazine are located behind the trigger making the barrel longer without increasing gun length. Because of the bullpup design this airsoft gun is as accurate as other airsoft guns with longer gun lengths. Featuring a fore grip and flashlight, you'll be able to steady your aim and hit targets in the darkness. So what are you waiting for? Get the Spring L86A2 Assault Rifle Airsoft Gun today and join the battle! This is a Spring Airsoft Rifle, which means it's powered by a spring and must be cocked for each shot. It's fast, clean, inexpensive and easily maintained; it requires no gas or batteries to operate. Also, Spring Airsoft Guns are the toughest, most durable of all Airsoft Guns, because they're made with few breakable pieces. If you're looking for a fun, reliable Airsoft Rifle that'll look great and perform even better, you've come to the right place. You must be 18 years of age or older to purchase this Airsoft gun.